January 27, 2014 - The prelude of a rare southeastern winter storm. January 28, 2014 - A layer of sleet covers the area, having fallen all throughout the day. January 28, 2014 - Snow is now falling on layer of sleet. January 28, 2014 - Snow ends, all is quiet. January 29, 2014 - Just before sunrise. January 29, 2014 - Sun shining through the clouds on a cold Luverne. February 1, 2014 - Dark clouds at sunset. February 3, 2014 - Pink Sunset February 5, 2014 February 7, 2014 - Sunset. February 19, 2014 - Fog February 19, 2014 - Lots of Clouds February 19, 2014 - Dark cloud behind water. tank February 19, 2014 - Dark, cloudy sunset February 19, 2014 - A few minutes later... February 20, 2014 - Ominous cloud with rays of sunlight. February 21, 2014 - Clearing February 23, 2014 - Fog February 26, 2014 - Deep, dark blue sky at nightfall. February 27, 2014 - Blue Skies March 3, 2014 - Light Rain March 4, 2014 - Gray skies of early March. March 23, 2014 - Very heavy fog on a early spring morning. March 28, 2014 - Heavy rain for a Friday during spring break. Heavy rain is predicted through Saturday. Spring breakers be careful!!! April Fool's Day, April 1, 2014 - Only a single bird in town to enjoy a beautiful morning. April 4, 2014 - A black cloud is rolling into Luverne. April 6, 2014 - Very heavy rain on an early Sunday morning...1.93" by 7:30am with more coming!!! (Note: The day ended with 4.30 inches of rain!!! April 7, 2014 - Very heavy rain early this morning...received 1.11" of rain by 8am. Ended up with 1.30". Lots of flood warnings. April 7, 2014 - After the 5-6 inches of rain God sent a beautiful sunset Monday evening. 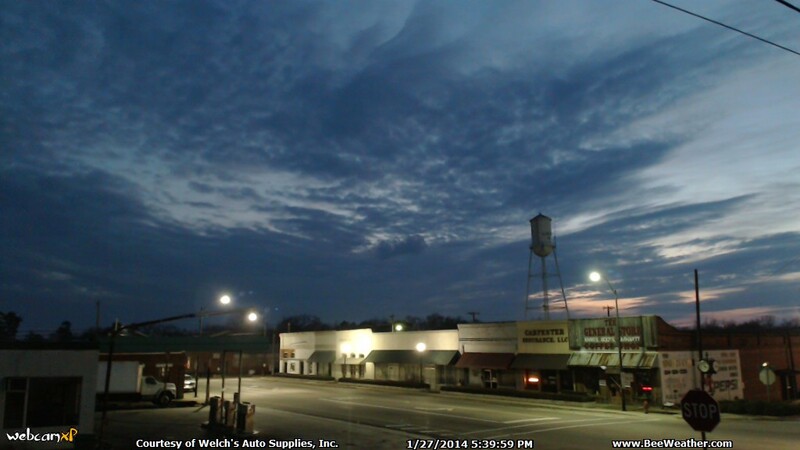 April 17, 2014 - A cloudy moon over early morning Luverne, Alabama. cam_041714moon.jpg April 18, 2014, Good Friday - Over an inch of rain so far today but the sky is lightening up in the SW. April 23, 2014, Very heavy fog this morning. The NWS has issued fog advisories. April 23, 2014, A little later in the morning, the water tank is barely visible. April 29, 2014, Lightning from the storm band that came through in the wee hours of the morning, part of a deadly storm system. April 29, 2014, Lightning from the storm band that came through in the wee hours of the morning, part of a deadly storm system. April 29, 2014, Lightning from the storm band that came through in the wee hours of the morning, part of a deadly storm system. April 29, 2014. Super bright flash of ligntning. April 30, 2014, 2nd night of the deadly weather system that killed over two dozen people across several states. April 30, 2014, 2nd night of the deadly weather system that killed over two dozen people across several states. April 30, 2014, 2nd night of the deadly weather system that killed over two dozen people across several states. May 29, 2014, God promises more than just a new day. May 30, 2014, heavy storms rolled through the area this after. One of our drivers ran into a tree that was blown across the road. May 30, 2014, heavy storms rolled through the area this after. May 30, 2014, heavy storms rolled through the area this after. May 30, 2014, heavy storms rolled through the area this after. May 30, 2014, heavy storms rolled through the area this after. May 30, 2014, heavy storms rolled through the area this after. June 10, 2014, A flash of lightning reveals an ominous cloud over Luverne. June 22, 2014, Some dark clouds moving over Luverne on a Sunday afternoon. August 18, 2014. Monday...extremely dark and strong storm rolls into Luverne. The weather station outside of town recorded over an inch of rain in a little over an hour. Lots of lightning. August 18, 2014. And then after the storm...a break in the clouds. Current conditions.